other times I want something a bit more complex. 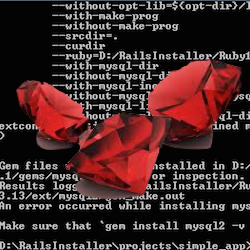 When I need more than a simple shell script, I like to leverage ruby for its vast library of gems which can greatly accelerate and simplify the task of building these helpful tools. as a gem. There are many concepts that I want to cover here, but that would prove to be a very lengthy post. To simplify and make this concept more easy to digest, this post is the first of a short series of posts. Sharing/distributing your tools becomes extremely easy. This post will walk you through a simple example that I threw together. The example utility is a tool to query wunderground from your command line called “wunder“. If you wish to follow along and use this example utility, you will need an API token for wunderground. bundler (you may need sudo if you cannot install gems locally). of the Wunder module. This keeps everything separate and organized for future use, and does not pollute your ruby’s load path. subcommands as arguments. That executable is placed in bin/ and is executable. Bundler provides some rake tasks to help you package, install, and even publish your gem.